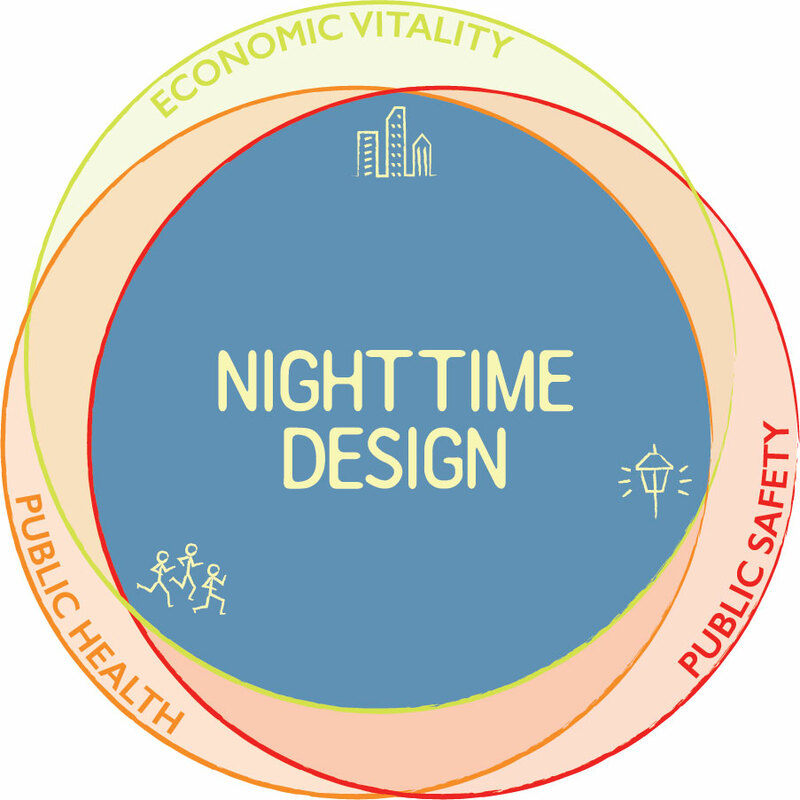 key members of the Smart Everyday Nighttime Design research team have discussed and connected to evolve the key principles of Nighttime Design (NTD). These three pillars are encapsulated in our graphic. This crucial initiative for lighting master plan development enables stakeholders to define nighttime objectives. Here, watch the step-by-step process in Double Bay (Sydney, Australia) with mayors, councilors and local business owners participating in the three-hour module. What can lighting do for a community? For some fascinating answers, just look at the results of one pilot research project in Cartagena, Colombia. A research-based, prototype pilot, blossoms with citizen participation. Urban design often neglects the nocturnal city. It is time to recognize the changing character of public space after sundown. The practice of Nighttime Design is a critical response to the after-dark experience, proposing new lighting solutions based on the in-depth study, for example, of local mobility, spatial elements, and activities. Nighttime Design positively impacts public health: illuminated streets extend walking hours, increase the number of social encounters, and stimulate economic activity through after-dark cultural and retail offerings. It also improves general wellbeing and feelings of safety in the community through crime reduction. Nighttime Design values local design solutions. In the case of the Cartagena-sited project, workshops and social/technical research led to the development of a universal LED lantern customized and localized for the area’s streets. The project team had two overall ambitions: the first was to conduct research and develop a sustainable Nighttime Design concept and methodology; the second was to improve community connections and galvanize local stakeholders through the use of private property for public lighting. During a community work session, in July 2016, operational 3-D lantern sketches were created to show how a neutral, modern object could be localized according to a specific urban environment – its culture, values, and symbols. With its blend of old and new components, the lantern prototype accentuated the character of Getsemaní. Its collaborative methodology brought together the interests of residential and commercial actors. Following the workshop, a “pop-up” prototype pilot installation was conducted on a commercial street. The one-day workshop and pilot were a point of departure for addressing critical issues of social/urban policy. The workshop included community stakeholders including politicians, artists, designers, cultural organizations and, most importantly, local residents. Historical preservation, infrastructure, heritage, tourism, mobility and visual effect were all discussed and debated. The project’s findings were captured on video by Plane-Site, a global agency specializing in full-cycle content strategy. This short documentary illustrates the research process, workshop and resulting prototype pilot – available to view in English and Spanish. Further information Smart Everyday Nighttime Design offers new opportunities for improving economic conditions, public health, social life, security and safety in after-dark environments. The researchers are especially interested in the global south where emerging economies, urban after-dark enthusiasm, heat and time zone combine as a rich cultural area to study, test and implement innovative approaches. The team welcomes expressions of interest from urban-oriented organizations in regard to pilot-based research. During the dark hours, a nexus of walking and observing living city streets — at once intuitive and self activated — merged into a performative and philosophical practice. 2009: I have been testing “nighttime design” as a descriptor for a new urban illumination fortified by expertise and input by fellow urbanists, urban designers, social researchers, geographers, economic consultants, landscape architects, just to name a few. In Cities of Light the phrase was committed to print for the first time. As you have read in this blog – urban nighttime is illuminated by public, private and found lighting. The phenomenological – reflections and sparkle – glint as figures of found light against the background of mono-typical fields of sodium yellow streetlighting, and more recently as a blinkingly, blindingly white-grey saturation. How long does it take to synthesize disparate focuses — lighting, city life, community engagement — into a meaningful body of work? Three years, five years? A decade? Smart Everyday Nighttime Design, international research accomplished with Arup, and partners such as London School of Economics, Despacio and iGuzzini, among others, was a recent culmination of the Light Projects’ 2012-2013 82nd Street Partnership Lighting Strategy: A Roadmap for Illumination and Community-Building. Envisioning the future of nighttime design. What does your city – or neighborhood – need? Near future vision: nighttime design teams composed of urbanists and city activators will form bespoke core consultant groups for specific urban regeneration projects. For example, those agencies, developers, associations revitalizing the nighttime economy in one district may need, along with urban lighting, public health and retail consultation. Another neighborhood might benefit from urban and landscape designers, policy experts and sustainability consultants. Perhaps night visibility, traffic and pedestrian conflicts are a primary concern. What about addressing the district’s upgrade to LED streetlighting along with a digital platform for seasonal lighting transformations, or for a cultural nighttime district where tourism and branding awareness is important…there is a team for that! Cities and districts may desire to create broad nighttime guidelines such as the excellent OPEN Sydney Strategy and Action Plan (pdf). It addresses nighttime economy, tourism, and diversity, among other important issues for international cities. Another current example is the concerted effort by the London Mayor’s office and Transport for London. Transport rolled out the spectacular “Night Tube” campaign in August 2016, followed by the inauguration of a Night Time Commission which resides in the Mayor’s office. Here, I have shared the process of envisioning a practice and the lurching tiny, and grand, steps that must be made in service of growth. A new understanding of illumination combined with urban design is becoming official, ensconced in city governance, which for theorists and practitioners alike establishes a context for the varied ways to improve lives — in our turbulently urbanizing world. In 2001, for their 20th anniversary issue Metropolis magazine’s back page featured several architects’ and designers’ quick visions for future designs or objects. Then, much public space was built as a result of private developer incentives – and meanly edged with serrated metal bars and spikes. Those were the days when benches were removed from subway stations. Now, in the age of Google Streetview and a increasingly laser-like focus on pedestrianization, my vision of a “mapping device” that identifies “negative spaces” such as forecourts, sidewalks and parking lots – which was not all that exciting or commonly shared value then — seems prescient. Next, connecting up atmospheres and activities through electronic controls. A scenography of public light and life. It was cold, it was dark…normal site study conditions. Arup staff and I braved the night with cameras, illuminance meters, laser measurement tools and paper plans to parse the high-pressure sodium nighttime environment. Here, an informal outcome, a 61-second video of the monumental Gowanus Expressway intersection, Sunset Park, Brooklyn. Marvel at the many illuminated phenomena – the blinks, the blurs, the limited color range…industrial building lantern effect, crosswalk retro-reflectivity, the glare of under-bridge fixtures and hazy baby-aspirin colored blanket of light…everywhere. … and imagine, if you dare, the future of this site, a pilot project to allow humanity to explore, with pleasure, perhaps fascination, the monstrous forms above and street level destinations that may develop through the taming process of light, green infrastructure and urban design. 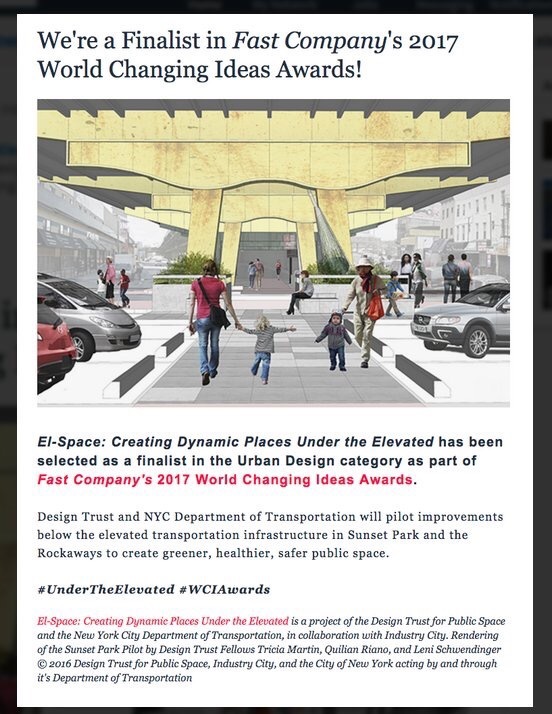 UNDER THE ELEVATED: PHASE II is a Design Trust initiative. The website spells out the background, process and profiles the three Fellows.